VAIO Care, by Sony, is a free systems diagnostics and optimization tool developed for owners of systems that were created by Sony before their PC business was spun off. The basic premise of the program is basic computer health diagnostics as well as providing some additional tools to help keep Sony VAIO computers up-to-date. The main layout of VAIO Care is easy-to-understand and provides quick access to system status, as well as quickly displaying any potential issues that VAIO Care has diagnosed. It also includes an upselling feature which attempts to have their customers purchase "VAIO Care Premium Tools" which, for the most part, aren't that helpful. Version 8.4.3.7161 is a freeware program which does not have restrictions and it's free so it doesn't cost anything. 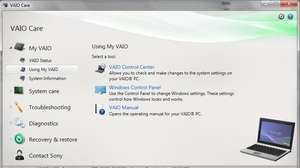 For security reasons, you should also check out the VAIO Care download at LO4D.com which includes virus and malware tests. Additional screenshots of this application download may be available, too.